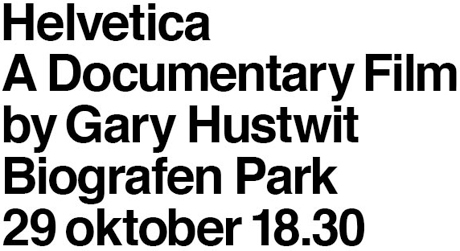 See the Helvetica Documentary film in Stockholm October 29. Presented by Research and Developement, tickets available here. Swedens No. 1 graphic designer Henrik Nygren finally got a portfolio site up and running. The European Logo Design Awards, Eulda has declared a new Best of Sweden Award winner. Snookerhallen logo by Bedow Creative. 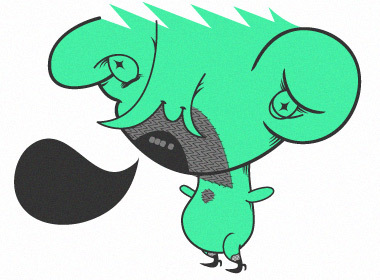 Mejan Labs is together with the PixelACHE founder Juha Huuskonen organising the second PixelACHE festival in Stockholm as a part of the Game Art exhibition in September and October. The Stockholm version, PixelVÄRK, will this time concentrate on seminars discussing aesthetic qualities and a club event with Dj and Vj performances. Check out the semi-stop motion video Rythm by Je Ne Sais Quoi. B-Reel has helped the Swedish Post Office to explain their services with the site Posten Showroom. Any season is a good season for stylish tees - even autumn. Check out the 50% sale at T-Shirtbutiken. New font by Bo Berndal at T4 called Cartesius now available at MyFonts. "Rene Decartes, the great French philosopher, was invited to Sweden in the 17th century, when the country was at the height of its power. In the university city of Uppsala he used the Latin name form Cartesius. The typeface that carries his name is inspired by letterforms from the 1600s, but upper case letters are of pure Roman type". CAP&Design wrote about T4 here (in Swedish). 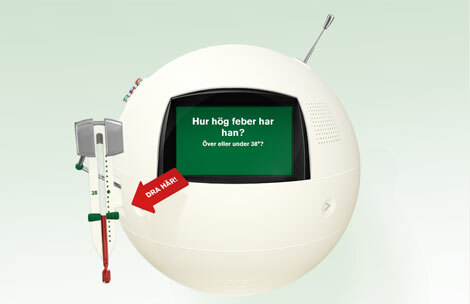 Great campaign site for Apoteket (The Swedish Pharmacy) created by B-Reel and ForsmanBodenfors. The main purpose of the site is for parents to check their childrens symptoms of cold. 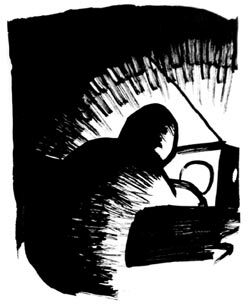 The site is entirely in Swedish, but have a go anyway: Barnförkylningsakuten. Acne has redesigned the logo and mascot. for candy retailer Karamellkungen (Candy King). Very sweet. English site here. Thanks iCity for linking Swedesres. Big thanks to ThreadlessWatch aswell. 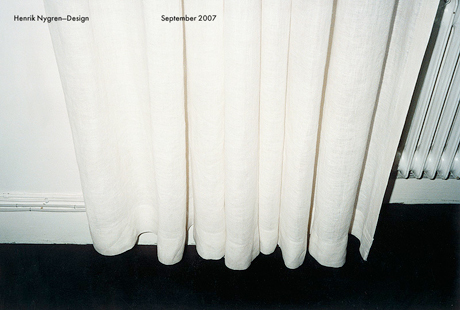 Art Director Robert Lindström of North Kingdom updates his portfolio site DesignChapel. Well designed site for the new and upcoming rock duo Johnossi. Have a look (and listen) here. Toy manufacturer Brio has a sweet site for their next generation of toys "Brio Networkers". Brilliant neck ties by Ulterior Motive. "Motor Mouth" is the new font by Martin "Core" Fredriksson. Available for purchase here. A report by The Council of Architecture, Form and Design on the establishment of a designmuseum in Sweden has been handed over to the Minister for Education, Research and Culture Leif Pagrotsky for consideration. The council seems very positive to the idea in their statement. Read the press release here, and the report here, in Swedish. English summary here. London based designer Ben Drury will stage his first ever exhibition in Stockholm at Beneath. The exhibition will run from the August 24 — September 16 and will feature a body of work entitled ”Trust me London”. More info here. The design collective New Beginnings are offering their font ”New Handwriting” in two weights for free. The font is based on an unsuccessful handwriting reform that the Swedish Head Council of Education attempted to implement during the mid 70s. Download it here. Edit: If you like that font you should definetley check out ”Montessori” by Stefan Hattenbach at Mac Rhino Fonts, as mentioned in the comments. The guys at House Industries are trying to understand the text on the Swedish candy classic ”Nöt Creme”. Read it here. By the way ”Nöt”=nut and ”God”=good in English. See also this previous post. 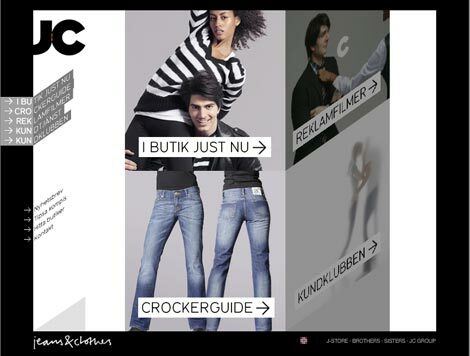 JC, jeans and clothes retailers has a new logo and site. The ”Boys & Girls” brand has been renamed ”J-Store”. Read a bit more about it at Resume. In Swedish. Excellent work with a contentdriven, honest and thoughtful approach. Check out the portfolio site of Martin Frostner. IKEA has launched yet another campaign site, this time it’s about their wardrobe selection. TenstaBo06 is a housing exhibition placed in the Stockholm suburb Tensta. The exhibition is showing housing projects that have been completed, in progress and planned. The focus will be on highlighting the potential and possibilities of the suburbs. August 17 — 27. Fult är fint. Live graffiti at Rosendals trädgård this weekend August 12 - 13 at 12.00 - 17.00 hrs. 120 meters of canvas will be painted by De Professionella Konstgangstrarna, Tele, Finsta, Murk, Killa, Ares, Möe-crew, Ollio, Kropp, Glue, Rabbit boy, Ians, Armsrock, CP-crew. The exhibition will continue until August 31. The new commercial for Schweppes UK by Mother was directed by StyleWar, watch it at Resumé here. Encina Creative is the online portfolio of visual communication designer Daniel Eek, who is born in Stockholm but is currently living in Sydney.